Because whether you realize it or not, you most likely spend at least a handful of hours per day on your web browser. Who can blame you? There’s a lot of important and resourceful information on there (not including time spent watching cute cat videos on YouTube). "What’s strikingly clear from our data is that the internet is capturing more and more of our time each day – with total hours spent online via PCs, laptops, mobiles and tablets growing from 5.55 in 2012 to 6.15 in 2014"
That’s a lot of hours! And with that amount of time spent on web browsers everyday, it’s no wonder the desire to make them even more powerful is rapidly growing, especially when it comes to B2B SaaS businesses. SaaS applications are becoming increasingly important to businesses in everyindustry, and most of them can only be accessed through a web-browser. Think about it, most businesses today rely on several SaaS providers: for communication, organization, accounting, or other things vital to their organization. In fact, the most popular Customer Relationship Management systems (CRM’s) are webapps. So, if you’re a salesperson reading this, you probably spend a lot of your time in Salesforce and it’s also likely that you’re reading this blog post in a web browser. Firefox and Google Chrome, two of the most used web browsers, allow users to install extensions to help users save time and increase efficiency and productivity. Developers at Microsoft Edge also recently mentioned their plans for a browser extension. In case you were wondering - browser extensions do just what their name implies: they extend the features of your web browser. Almost all of the most used web browsers online have extensions. And that really comes as no big surprise - since they assist users when it comes to answering and organizing emails, generating sales leads, storing and sharing knowledge, etc. So while you are spending a significant amount of time in web browsers, it's important to understand how powerful they become when extensions are installed. Extensions run seamlessly in the background of your web browser (seriously, you don’t even notice they are there until you need them). They fit perfectly in your existing workflow, and help increase productivity and optimize your time. Dashlane is a browser extension that helps consolidate your passwords into a central database and safely share them amongst a team of people. Their product is only needed when you login and logout of other web services, so their Chrome extension is visible and easily used when on those pages only. It’s helpful because you just install it, and continue to work as you would. It works with you, not against you. Another great example is Email Hunter, which allows an SDR to find a prospect’s email address in one click. 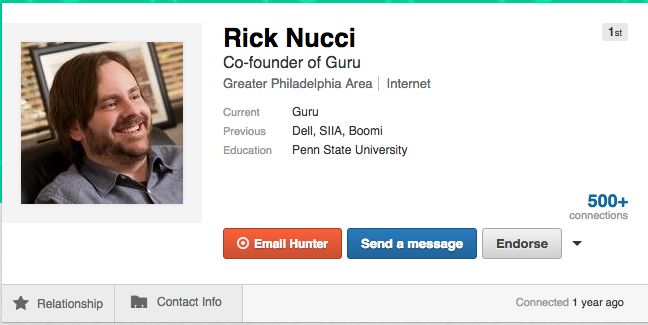 They take your workflow seriously by integrating directly into LinkedIn profile’s themselves. Now as a rep, you don’t even have to leave their profile page and can get a result instantly. Instead of switching tabs to enter in each prospect’s information, the answer you need to do your job is one click away. Ultimately, a browser extension can simplify any process by just showing up right in your web browser’s toolbar, eliminating the need for "another destination". Basically, they’re like a good friend - always there when you need them. With the help of an extension the actual applications you use become even more valuable. For example, extensions like YesWare supercharge your GMail experience by giving you features, such as open tracking, that you can’t use in GMail alone. Augmenting your existing applications is something we have bet big on at Guru. It’s the key driver behind our Context feature, which allows you to surface key information the moment it’s needed...right from the existing applications you use everyday like Salesforce, ZenDesk, or LinkedIn. Ultimately browser extensions allow you to focus on the "jobs-to-be-done" to create an experience that optimizes for ease of use and overall better adoption of the application. Remember the first time you realized Google play store and the Apple store were practically limitless? There are so many apps, that chances are you’ll have no problem finding the right ones for you. Discovery becomes an issue as there are so many applications to choose from. It’s like that with browser extensions, too. The barrier to entry right now is low, which is a great thing for both the developers and community. For example, creating your first Chrome extension isn’t as hard as you might think, if you’ve got some basic web development knowledge. This also creates higher competition amongst app developers, and a greater need to differentiate their product. Because of this businesses who are able to build high quality experiences and products an edge. Startups (like us) are committed to utilizing the power of extensions. As the ecosystem and landscape develops we believe it’s only going to help produce higher quality products and experiences. Microsoft even released an Office Chrome extension, and I predict we’ll see existing businesses will start to take notice as well. It’s truly an exciting time to be apart of this ecosystem as it expands and evolves. So keep an eye on what happens with browser extensions over 2016, because things are just heating up. We’re certainly all-in with Guru now available for Chrome, Firefox, and Opera! Let us know here in the comments or over on Twitter!